We had another unfortunate incident in the garden yesterday, something that made not only me sad but upset one of my cats too. 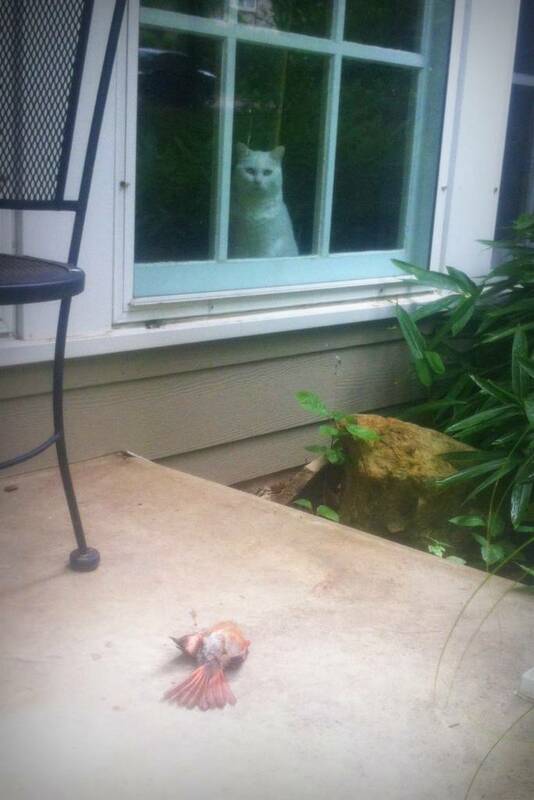 Do you remember Kumo (formerly known as "Super-Whitey" while she still lived in our yard)? Well, she had a front-row seat to an incident. ...but apparently it was not as light as I hoped. 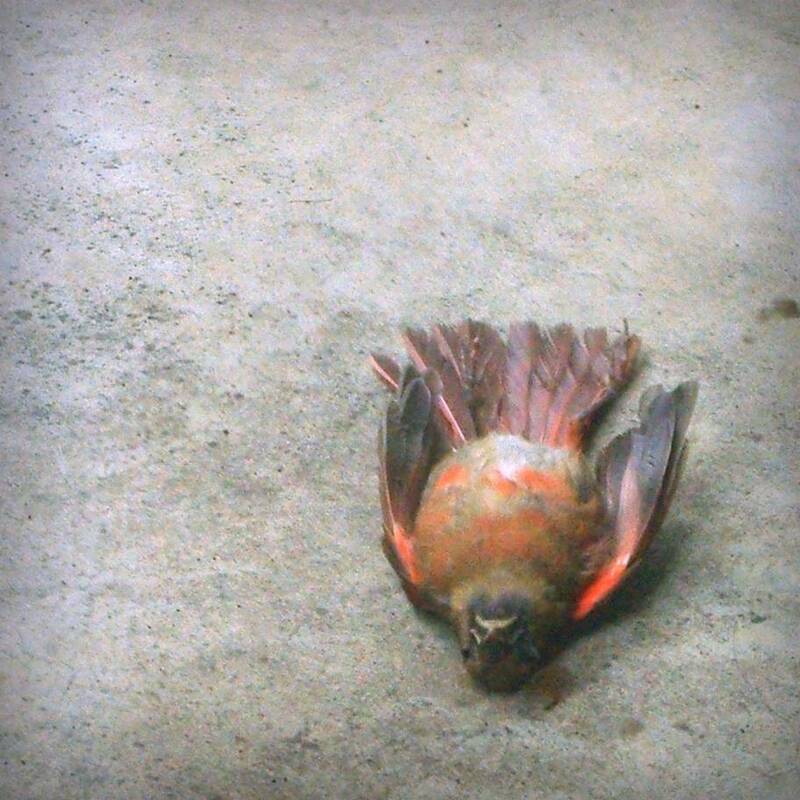 This cardinal is the second bird that has died by flying into my windows this year -- that I know of. 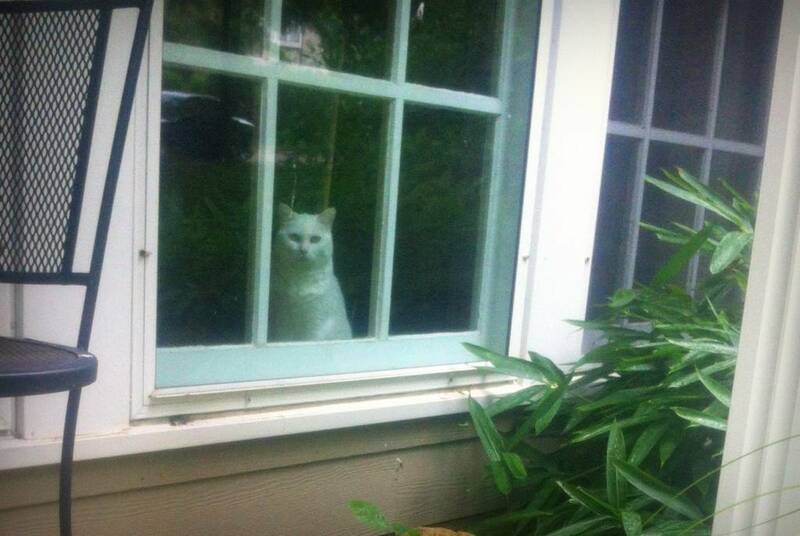 It's such a sobering event... Kumo was sitting at the window when it happened, and saw the whole thing. She was making a lot of noise after it happened, but I suspect that was more "I want that bird!" than sadness over the death. I really think that I'm going to install netting over my windows at some time in the future. 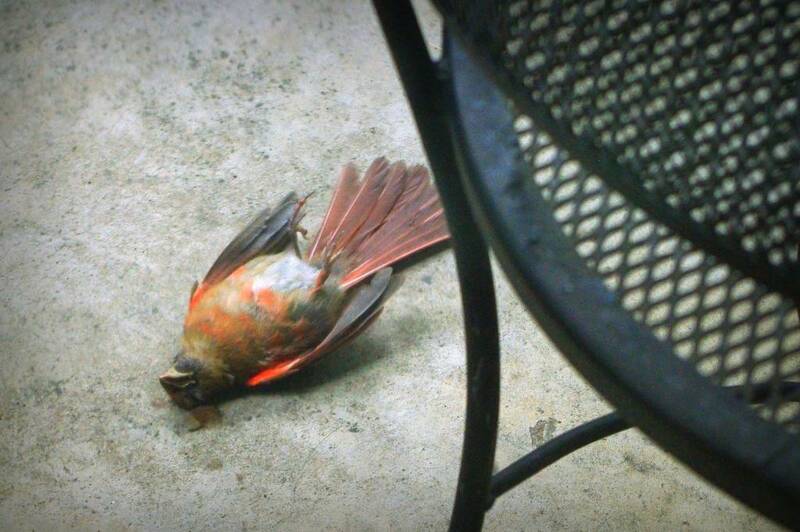 I enjoy having the birds around so much that I just can't help getting upset over these preventable deaths. Sorry for the down post today, but I think it's fairly important to raise awareness of this. Have you done anything to your windows to prevent this sort of tragedy? I'm interested to hear about it! Awww :'( I'm so sorry, for you, and the bird. Our last window strike was lucky, and just stunned. It is sad when birds hit the window too hard. I remember years ago the shock of hearing a super loud thump, and rushing outside to see a Marsh hawk on his back in the dirt. All I felt I could do is try to calm him with my voice because there is no way I'd get close to those talons. I went inside and watched him until he got his senses back and flew away. That happens here at least a couple times a year. I dread it but I'm not sure I want to resort to installing nets. We've been fascinated - and somewhat horrified - to learn that bullfrogs eat birds. And sometimes they don't actually eat them - they just kill them and leave them floating in the pond! We've found five or six birds so far this summer. Eating them would be one thing, but killing them and spitting them out? That's not good. Did you know bullfrogs have teeth on the top of their mouth? I keep a few stained glass items suction cupped to my largest window and it seems to help. Window decals break up the reflection and alert the birds that its not more airspace they're flying into. I just leave up Christmas snowflake decals, or 'clings', through spring, till the sun moves far enough to get the reflection off the worst window. Those window clings that are like jello, though- cats love to chew those. Has to be the static cling vinyl to avoid cat chewing. Here in Texas, my husband and I installed solar screens on the windows to help with the heat. The first electric bill after we installed them proved they were well worth the money and time spent. They look like regular window screens that cover the whole window, but the material is much thicker. We discovered a bonus this past winter. As long as you are not backlit, you can see out, but nothing outside can see in. We set up a bird feeder next to the window and even our dog doesn't spook them when he's nose to the glass close. This might be an option for your bird-strike problem. That reminds me of a video my wife showed me. It was a guy trying to wake up an owl that flew into his window and got nocked out. He's basically just standing next to it saying "hey, hey buddy, are you ok?" in korean (she translated it for me). The bird woke up, dazed, and noticed him, then suddenly took off flying away and it scared the crap out of the guy. Funny video.